Anybody want to chime in with their formula for the perfect Italian hoagie? Best Yogurt in Silicon Valley? Hi, my name is Matt, and I have a yogurt problem. It started last month when I discovered the joys of Pinkberry yogurt on my trip down to Los Angeles for SIGGRAPH. Pinkberry is different from “normal” yogurt like TCBY because it has a tart (or slightly sour) taste. If you’re living in middle America with no access to fancy-pants yogurt, the closest taste I would compare it to is DanActive yogurt. Except that I didn’t like DanActive at first, but Pinkberry had me hooked before I finished my first bowl. Here’s the problem. As soon as I got back to Silicon Valley, I looked up nearby Pinkberry locations. The closest one is in Valencia, California, nearly four hours to the south. I’m an optimistic man, so I wrote to Pinkberry and asked if they’d be opening up any locations a little closer. They wrote back to say they have expansion plans, but not currently in Northern California. So how was I supposed to get my sour yogurt fix? I searched on the net to find similar yogurt places. First I tried Fraiche Yogurt, a small yogurt cafe in Palo Alto. The yogurt was high-quality, but it didn’t taste exactly like Pinkberry and their mochi was a little soft. Next I tried Yogurt Fantasy on Castro Street in Mountain View. The mochi was good, but the yogurt wasn’t quite as savory as Pinkberry. I also tried Willow Glen Frozen Yogurt Company in the (surprise) Willow Glen neighborhood of San Jose. Of the local companies, they had the closest to Pinkberry-flavor yogurt, and they put toppings in the middle of the yogurt, not just on top, which is a neat trick. But I finally found a place that tastes almost exactly like Pinkberry. It’s called Red Mango and it’s in Palo Alto. In fact, the store was opened by Yul Kwon, who won $1 million dollars in 2006 on Survivor: Cook Islands in 2006. If you’re hooked on this whole yogurt craze, there’s a ton of backstory behind it. Red Mango opened first in Korea in 2002, and there is bad blood between Pinkberry and Red Mango. Pinkberry faced a class-action lawsuit for not disclosing all the ingredients in its yogurt at first. 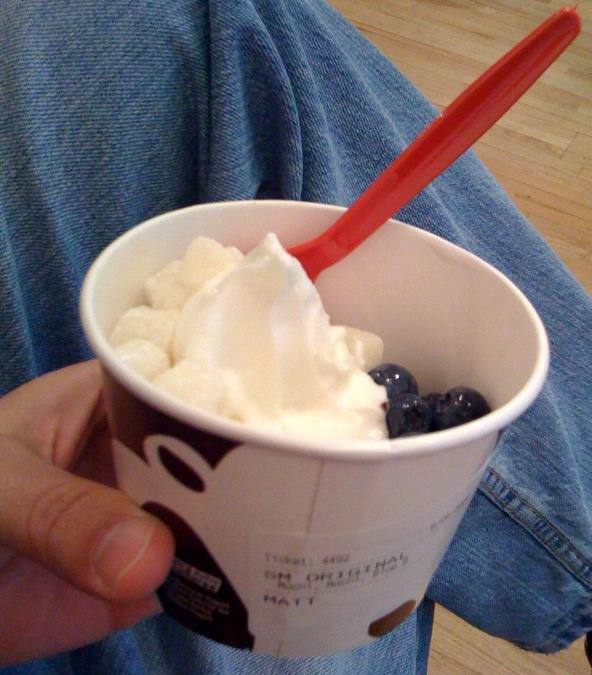 Meanwhile, Red Mango has emphasized the healthiness of its yogurt, such as no artificial flavors or colors. Garland found that Red Mango had continued to add franchises in the time since Kwon’s group was granted a building permit. So by now – and even Young admits this – there are more than 11 locations across the country. Case closed, said the North Beach watchdogs. One thing is certain: this sour yogurt craze will only get hotter. It sounds like Yogurberry is opening a store on Castro Street in Mountain View soon, which means I’ll visit soon after the store opens. Happy yogurting! I saw that Wendy’s had introduced a new spicy chicken sandwich, and I like spicy stuff, so I had to try it. It had pepper Jack cheese, spicy chipotle sauce, and jalapenos. So how did it measure up? It wasn’t as spicy as I was hoping for. If you want a mass-market spicy sandwich, I’d opt for the spicy chicken sandwich from Jack In The Box. Eating a Habanero Hamburger was once a rite of passage for new and departing operating systems engineers at Silicon Graphics. The tradition is apparently still alive and well in the graphics group. Having set the Silicon Graphics company record for number of Habanero Hamburgers consumed, Brian Totty brought the fine tradition to Inktomi Corporation. That sounded like a neat idea, so a few years ago several of us Googlers made a pilgrimage to the pub in San Mateo. To make a long story short, the habanero burger was painfully hot. The habanero part referred to a thick red paste that sat atop the burger patty. After we ate the burgers, the staff clued us in on a few tricks: ordering the burger with mayonnaise or a glass of milk would reduce the burn. Knowing that beforehand would have saved a day or two of intestinal discomfort. 🙂 My wife couldn’t believe I was willing to eat an entire burger — but it was a good bonding experience with some fellow Googlers. The pub is closed now, but there’s a video of someone eating a burger. If you watch it, you can see the burger heat from their facial expressions. The Prince of Wales Pub evidently closed in January 2007; does anyone know where else to get spicy food in Silicon Valley now? You have to leave room in your life for serendipity sometimes. For example, without an accident, I never would have discovered the joy of bacon polenta. (All the people who say “Matt, I thought you were going low-carb?” can step off. I’m playing hockey today. I’ll skate it off.) The Google cafe may like to call it creamy polenta, but as a Southern boy, I just think of it as cheese grits. It’s even better with bacon. Mmmm. Bacon-y goodness. Accidents in crawling/indexing/scoring happen too. Sometimes they’re happy: “If we turn this factor off, scoring gets better? Cool!”. Sometimes they’re unhappy: “What happened to this page?” One of my least favorite accidents is when someone reports a 301 or 302 problem. The heuristics we put into a place have greatly reduced complaints about “302 hijacking.” For the first time in ~1 month, I got an email about a “302 hijacking”. This case was especially interesting because I got an email from both sides: someone from the destination site wrote, and the source site also wrote to say “we didn’t mean for this to happen.” I take that as a kinda good sign; when I hear about it from both ends, 302 problems are hopefully much more rare. I passed the info on to the mailing list we have for that, and I’ve asked a colleague to email both sides when we get it debugged. What do you do if you suspect a “302 hijacking” but don’t have my email address? There’s a convenient way that should get your report to the same engineering list, where it will get the same level of investigation. Go to http://www.google.com/support/bin/request.py and click “I’m a webmaster inquiring about my website” then select “Why my site disappeared from the search results or dropped in ranking” and click continue. In the webform that you get to, make sure you put “canonicalpage” in the Subject line, then put the details in the Message body. Someone will route that message to an engineering mailing list where we dissect claims of canonicalization problems (that is, picking the wrong url). I also got one email today about a site being indexed under both www.domain.com and domain.com. The proper procedure (assuming that you want www.domain.com to show up) is to make domain.com do a permanent (301) redirect to www.domain.com. The person that wrote said that we hadn’t crawled domain.com recently to find the 301/permanent redirect. I’d be curious to hear feedback (in the same way as the paragraph above) to see how many other people are running into this issue. This is the second time I’ve worn my Ale8 1 T-shirt and it turned out to be a good day at work. I’m starting to think it’s lucky. Some people think that the height of being a Kentuckian is going to the Kentucky Derby. Nope–I know very few Kentuckians who drink mint juleps by choice. Real Kentuckians drink Ale 8-1. 🙂 If you’ve never heard of it, consider yourself hipper than the people who won’t hear about it until Elizabethtown comes out.